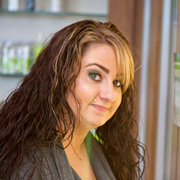 Keeping up with inventory for a busy, upscale salon and spa is no small feat, but Brittney handles it with efficiency and consistency! Super motivated, organized and a great multitasker, she is always ready with a smile to meet the product and equipment needs of our Cassandra team and those of our clients! When she is not at work inputting invoices, receiving goods, restocking shelves or ordering supplies, Brittney loves to spend time with family and friends, especially her beautiful little girl, Aubri!